In stereotypical Thoroughbred fashion, Oz gets bored with bits fairly quickly. As we’re focusing on different aspects of our training, I like to switch bits to help facilitate our training. It’s kind of like switching between running and walking shoes depending on what you’re training your muscles to do. I decided to share my research into hackamores in case anyone else is considering the switch! A hackamore is simply a nose piece used to control the horse, rather than the traditional metal bit going through the horse’s mouth. Some call it a “hackamore bit”, but I’m going to reserve this term for the combination hackamore bit. Generally they work by applying pressure to the horses nose, and poll. There are several different kinds, with different purposes—just like any other type of bit. 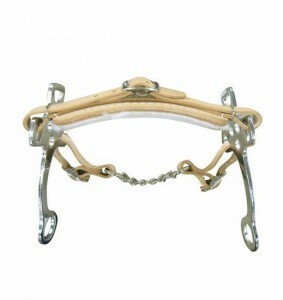 English Hackamore: Flat nose piece, with a short shank and curb chain. 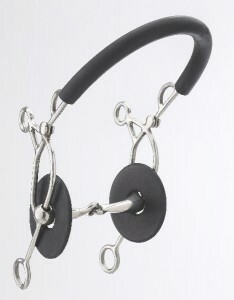 This hackamore is common for training purposes and is a great starter hackamore (it’s the one I use). It’s soft on the horses face, and can even come with sheepskin padding or without. German Hackamore: The german hackamore has longer shanks and, although fairly straightforward, has a bit more “breaking power”. This hackamore is similar to the German, with the longer shanks—this time curved for added steering & control. It doesn’t have to have the sheepskin nose piece, but sometimes acts as a shadow roll for spookier horses. Combination- Hackmore Bit: Just like it sounds, a combination of a bit and a hackamore. 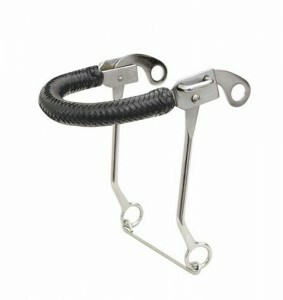 Get the benefits of the hackamore, with the backup of a bit! (Note: There are a lot of happy-mouth combination hackamore bits… I prefer the all metal, as they’re less likely to break in the horses mouth). When should I use an English hackamore? I’ve focused primarily on Dressage all winter, focusing on the elasticity of Oz’s frame and working from the hind end. With show season creeping up, I’d like to start incorporating this work into our jumping flat work and encourage a little more self carriage. Oz has also suffered from ulcers/canker sores in his mouth which we (vet) think is the reason he sticks his tongue out the side of his mouth with a bit in his mouth. 1. Start on the ground. Turn your horse in both directions and do a couple transitions from walk to halt in hand. 3. Do a million or so transitions from walk to halt, halt to walk, rein back, and transitions within the walk. Rome was not built in a day! Your horse needs to learn this new “language”. 4. Follow your horses head with your hands. You can go 10 steps backwards in your training very quickly by being too rough with your hands. Your horse has to learn they’re free to go forward. 6. Don’t give up! You don’t have to ride in the hackamore every day. Try transitioning it in slowly. I’ve started doing 3 dressage rides in a snaffle, 2 flat/hack rides in the hackamore, and 1 jumping day per week. I usually do 1 “fun day” in the hackamore as well, but we’re not working.